Andre Ward, one of America’s great Boxers. Andre, as a light heavyweight, won the United States’ only Olympic gold medal in boxing in the 2004 games; this was the first boxing gold since 1996. Andre was born February 23, 1984. At 32, he currently still lives and trains in Oakland California. He has three sons, Andre Jr., Malachi, Micah and a daughter Amira. Andre started boxing in 1994 and won over 90 matches as an amateur. In 2002 he won the Under 19 National Championship; and was a 2 time U.S. National Champion in 2001 and 2003. His Pro debut was against Christoper Molina on the Johnson-Traver undercard in Los Angeles. Since turning Pro in 2004 he has a record of 30 wins and 0 losses. Since 2016 he has been fighting as a Light Heavyweight (prior to this he was Super Middleweight). Andre ended a layoff of about six months with a 6-round unanimous decision over Derrick Findley on the undercard of a bout between Vitali Kopitko and former WBO light heavyweight champion Julio Gonzalez. Fighting for the first time since tearing a ligament in his left hand, Ward did look a bit rusty in winning. He is being trained by his Godfather Virgil Hunter (Andre’s father died from cancer in August 2002, and he has dedicated his fights to his dad). He is signed with RocNation Sports for promotion and James Prince is his manager. Andre fights with the orthodox right and southpaw stance. He has tremendous speed and technical mastery, to the point of being a coach in the ring. Andre is a polite young man and very mature for his age. His outlook is very positive and he puts a lot of faith in God. 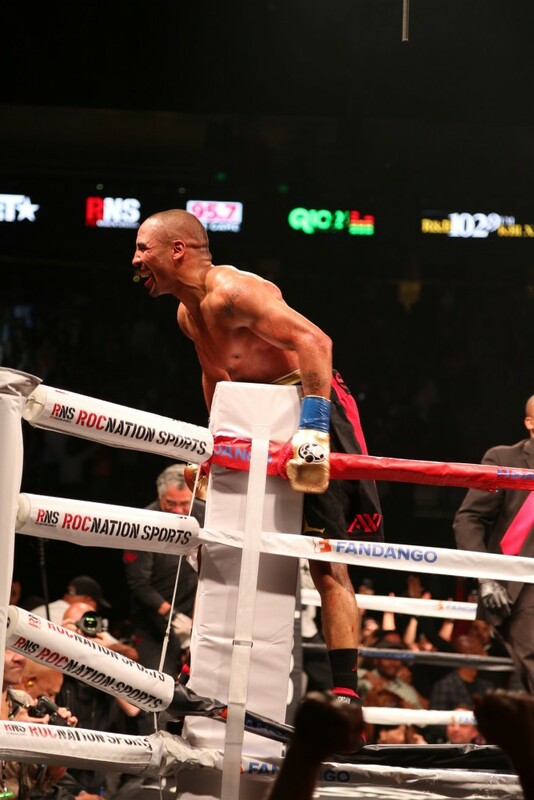 Andre Ward- the next Sugar Ray? Maybe the next Ali! *We think it might as well be “Speed over Ground”! I second the comments by Joe below in regards to speaking arrangements. You are a true inspiration! It’s a shame that everyone in the world has not yet heard of you.How can that be? You have not lost a fight since you were 12 years old, last male American boxer to win a Gold Medal, several World championships, devoted husband/father and above all you have the formula for success– You are a Man of God!! No surprise why you have been so successful he is the ultimate foundation! I only pray that our youth can take notice and follow your lead and example! Your testimony is a true inspiration and should be applauded. GOD BLESS YOU! Im a boxing fan from Stirling, Scotland. its the monday after the Dawson fight and I have to say Im over the moon for Andre. To me this is the start of Andre proving to the world that he is the best pound for pound fighter. Saturday was a great peformance and it is an honour to see the rise of a fighter who is going to be remembred as a great. keep shining Andre. Scotland fight fans are behind you big time. Andre ward is the best super middleweight in his division and ward should have the spot as the best number 3 pound for pound boxer in the world. SOG IS JUST WHAT THE DOCTER ORDERED………I AM SO IMPRESSED I HAVE BEEN TALKIN U UP SINCE THE CHRIS MOLINA FIGHT IN 2004 DUDE U CANT BE STOPPED!!!!!!!! Hey Champ! Congrats for the Abraham win! I’ve been following u for years and it’s been a pleasure. Love ur work ethic, skill and determination! As an former amateur boxer I’d like to differ from the previous comment. Roy Jones Jr, Floyd Mayweather Jr. and Andre Ward will go down as the best of their era. U just keep doing what ur doing and always believe in yourself! Keep up the good work Champ! I am a true boxing fan. I remember when Jersey Joe Wallcott knocked out Ezzard Charles like it was yesterday. My comment is that Andre Ward is the best boxer in the world today. My granddaughter Ashley McDill is the fiance to Roger Cantrell. who fought Andre in St Lucia. I cant think of any Light heavy that could beat Andre today. Andre Ward and Pacquio will go down in history as the best boxers in the world. Jim J. McDonald. Kent WA.